Great to see 2 Rugby players, Anthony and Daniel, in the Warwickshire10&U Boys County Cup team. Report below from team captain, Tony Pillinger. Also congratulations to Emily Green on selection for the Warwickshire 9&U Girls County Cup team. You may have followed the regular Twitter updates, but here is a breakdown of the 10U boys’ event. Warks were drawn in a box of 3 with Shropshire and a very strong South Wales team. First up, Warwickshire beat a relatively weak Shropshire team 4-0 for the loss of very few games. Against South Wales, Anthony put up a good fight before losing 4-2 4-0. Ferran lost a close one at 2, 5-4, 5-3. 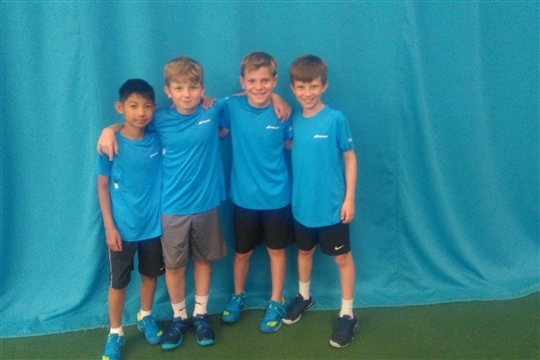 After Daniel won at 3, 4-2 4-2, Anthony and Daniel lost 4-2 4-1 in the doubles meaning that we finished second in our box and had to play the other group winners, Staffs in the semi-final on the following day. In the semi-final against Staffs, Anthony got us off to a great start beating their 1, 4-0 4-0. Ferran lost a close one on a CT but Daniel gave us a 2-1 lead going into the doubles. Anthony and Samuel completed the job in the doubles meaning we got to play South Wales again in the final. Anthony fought hard again against the South Wales number 1 but lost 4-2 4-1. Ferran was then down a set, 3-0, 40-0 and facing 4 match points! Remarkably, he managed to turn it around, winning 1-4 5-3 10-5! After Daniel had won at 3 in a CT, Anthony and Samuel finished the job in the doubles 2-4 4-2 10-4. It was an excellent weekend; the boys did amazingly well to make the National Finals beating a strong South Wales team who were favourites to progress from that group. Warks were drawn in a very tough box with Herts, Yorkshire and Northumberland. Herts and Yorkshire and a full squad of Grade 2 level players, and on paper were much stronger than us. That was reflected in our matches with them where we lost 4-0. However, in both the doubles matches, we were highly competitive having a set point against Herts, and taking Yorkshire to a CT. I couldn’t fault the boys’ attitudes and effort, and the hard work was rewarded in the third group match against Northumberland. Anthony won a CT; Ferran lost a tight one 10-8 in the CT and then Samuel gave us a 2-1 lead going into the doubles. Anthony and Samuel won the doubles to give us third place in the box and a 5th/6th play-off against Avon. Against Avon, Anthony lost to their very strong 1, 5-4 4-0. Daniel won at 2 in a CT and then Samuel did an amazing job of coming back from 9-6 down in the CT to win 11-9. In an extremely close and long doubles, Ferran and Daniel came through to win 5-3 4-2. That gave us a 3-1 win and 5th place overall. The boys (with great support from their parents) were fantastic at both events. Although Warks have won this age group in 2 of the last 4 years, a 5th place finish was an amazing achievement given the players’ current level. Realistically, we were not expected to even get to the Nationals, so to not only get there, but to finish 5th of 8 was extremely impressive. I’m sure they have learnt a lot from the experience and that will hold them in good stead for upcoming County Cup challenges.